Scott Anderson - Two Is Better Than One! The 1999 car, nicknamed "Roadkill"
A race season ending in a track title places a driver in a special group of racers that we call "champions!" Some of these have set themselves apart from the rest by winning multiple championships during their career. And of those, there is an even more elite group of racers who have accomplished the extremely difficult task of claiming multiple championships in a single season. Our Dirt Driver Spotlight focuses on one of these rare champions. Scott Anderson was born and raised in Omaha, Nebraska. Growing up, Scott enjoyed hunting, fishing and playing football. But eventually he would work his way into the world of motorsports - one step at a time. In 1980, at the age of 17, Scott built his first Demolition Derby car and entered several Demo events during the 80’s at Sunset Speedway and Westfair. In the late 80’s he became more involved in circle track racing by helping crew on his brother John’s Hobby Stock car. His involvement with John’s team got Scott craving more speed than what the Demolition Derbies could provide. Drag racing his motorcycle in Scribner, Nebraska satisfied part of his racing need, but he still wanted more. Finally one night, John let Scott hot lap his car at Shelby County Speedway in Harlan, Iowa. "That settled it!" Scott admits. "I was hooked and had to get my own car!" Scott went to work right away building his first racecar - an Enduro car. The car was a ’75 Ford so Scott thought 75 would be a good number for the car. He decided to expand it to #75c just in case #75 was already taken by another driver. Scott’s father Bob painted the lettering on the car. When he painted the "c", he decided to draw a line through it, converting it into a cent sign, joking that 75¢ was all the car was worth! This began the tradition of Scott Anderson in the 75¢ car. "Then later we came up with the saying ’75 and NO sense’", laughs Scott. 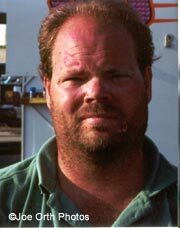 Scott would start his circle track career in 1991, driving the car in Enduro races at Eagle Raceway and Beatrice Speedway. He also entered it in Figure-8 races in a class called Crazy 8’s, and eventually finished the car off in a Demolition Derby. He then proceeded to build another Enduro car, sticking with the 75¢ number, and running a similar schedule. The 1994 season brought Scott the opportunity to take another step up the racing ladder. Mel Leonard, owner of the #48 Pro Am Camaro, had been keeping an eye on Scott and liked his style of driving in the Enduro races. "We met one day at Ultimate Racing Products and Mel offered me the seat in his Pro Am," Scott explains. Scott accepted the offer, which led to a successful two-year partnership with Mel. Racing the car at Eagle Raceway as #48 and later back to #75, this time without the cent sign, Scott finished 12th and 5th in the point standings those years. In 1996 Scott decided to return to the owner/driver role and built his own car once again. He campaigned his #75 Camaro Pro Am at Eagle and finished 9th in points. In 1997 he ran both Eagle and Sunset, finishing 3rd and 10th in points. 1998 marked the first season that Scott competed every week at both tracks. The hard work paid off with the track championship at Eagle, a runner up to the championship at Sunset, and many A Feature wins. 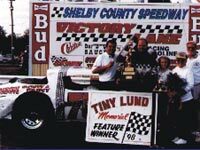 He also won the prestigious Tiny Lund Memorial race at Shelby County Speedway and was given the Most Popular Driver Award at Sunset. Scott also made a strong showing in 1999, finishing 6th at Eagle and 3rd at Sunset. Throughout this whole period Scott made many impressive appearances in the Pro Am at other tracks, such as I-80 Speedway, Beatrice Speedway, and Adams County Speedway in Corning, Iowa. With so much success behind him, Scott was looking forward to the 2000 season. He built a second Pro Am and would run both cars during the year. Scott didn't have any specific goals to start the year, but after winning the opening night features at both Eagle and Sunset, he started thinking about the possibilities of a double championship season. "How can you stop trying when you're in the lead?" he asks. The statistics for the season are beyond impressive - 5 wins, 24 top fives, and 29 top tens in 31 A Features at the two tracks. Even more outstanding is the fact that Scott started 26 of those features from the sixth row. He also won the Sunset King of the Hill contest, finished a strong 3rd at the State Fair Championship race in Lincoln, and collected additional wins at other tracks, bringing his total career feature wins to 26. But most importantly, he claimed both track championships at Eagle and Sunset, never once surrendering the point lead at either track during the season. And his Eagle Championship gave him a 5th place ranking in the NASCAR Exide ShorTrack Series Great West Region. Scott credits his sponsors for helping him in his success. They are Quality Tire, Benson Body & Paint, Anderson Signs, Ultimate Racing Products, Willard Automotive Machine, and Rainbow Realty. Scott performs most of the weekly maintenance on the cars himself but has a loyal crew that helps out at the track. The crewmembers are Ben Hennecke, Jill Tadlock, and Mike Dondlinger. Scott also appreciates the support from his fiancée, Jenifer Merica. "Jenifer built and maintains my racing Web site, sells my racing t-shirts, and videotapes all of my races," says Scott. Scott’s whole family enjoys racing. His older sister Kim supplies the garage for his racecar, and her two children, Christine and Max, are big fans of Scott’s. Max has been helping Scott with his car since Scott first started racing. He is now 13 and is already talking about racing his own car in a few years. Scott’s younger brother John, whose car Scott first hot-lapped in 1990, now runs in the Late Model class. "Because John runs a Late Model, most people think he is older than I am, but he’s younger," Scott points out. Scott's team and John’s team are completely separate but if one or the other ever needs a hand, they will do all they can to help each other out. Their parents, Bob and Jayne, are big supporters of both of their sons’ racing efforts and are very proud of their accomplishments. Bob, a previous drag racer and talented artist, has hand-painted many of the signs on Scott’s cars through the years. Bob is the previous owner of Anderson Signs, one of Scott's sponsors, now owned by Scott's brother John. Scott now resides in South Omaha. During the week he is a mechanic at a local golf course. He also enjoys spending time with Jenifer. They plan for their engagement to continue for a few more years and are in no rush to set a wedding date. Scott enjoys listening to rock music and watching "The 70’s Show" on TV. His choices for movies are comedies and action films. His favorite food is steak. When asked what his other interests are besides racing, Scott laughs and says, "Is there anything else besides racing?" Knowing it will be difficult to top the accomplishments Scott achieved during the 2000 season, his current goals for the upcoming season are very realistic and very refreshing. "I just want to be competitive and have fun," Scott explains. With his brother racing a Late Model, Scott often gets asked if his future plans are headed down that same path. "I’m staying in a Pro Am - a class I can afford," he replies. This is not good news for the rest of the competitors in the Pro Am class, but at least it is ample warning that they’ve got some homework to do during the winter to catch up with Scott in 2001!